The Fuller Center for Housing has had many student groups work with its covenant partners through the years, especially during spring and summer breaks. Many of these student groups are affiliated with clubs or organizations on their respective campuses. But with students from the University of Idaho, the entire campus is service-minded. Three groups from the University of Idaho are working with Fuller Center covenant partners this week — with Southwest Quarter in Lumpkin, Ga.; Webster Parish in Minden, La. ; and Ginger Ford North Shore near Hammond, La. They were sent by the Associated Students of the University of Idaho’s Center for Volunteerism and Social Action. The years of encouraging students to volunteer — with some majors required to perform service hours — have fostered an atmosphere of service that has become contagious. Students are serving because they want to. “We promote service learning so that students will gain practical work experience, but many contact us just because they want to serve,” said Center for Volunteerism and Social Action administrative assistant Meladi Mottern, a 2009 graduate of the university contacted by phone Wednesday. Not only are the students willing to give of their time, but of their money, as well. And Wetzel said it’s been worth every moment and penny to contribute to the Southwest Quarter Fuller Center’s first build, a home that will go to single mother Alethia Starling and her three children. The spirit of service is so contagious, in fact, that it has spread to the faculty. The students in Lumpkin, Ga., are being joined on their trip by Denise Bennett, a senior instructor in video, television and film production with the university’s School of Journalism and Mass Media. “I always recommend to students that they go on an alternative service breaks, study abroad or just get a new experience. So I decided that if I’m going to talk the talk, I should walk the walk and do it myself,” said Bennett, an accomplished filmmaker whose short “Pups” about high school football players won the Best Overall Short Documentary Award at the 2010 All Sports Los Angeles Film Festival “I’ve never done a service trip. I’ve done community service work, and we use service learning in a couple of classes that I teach, but I’ve never been on a trip like this. And Bennett is glad the “big push” has shoved her into a warmer climate for a little while. Read and watch a video about other spring-breakers working with The Fuller Center. 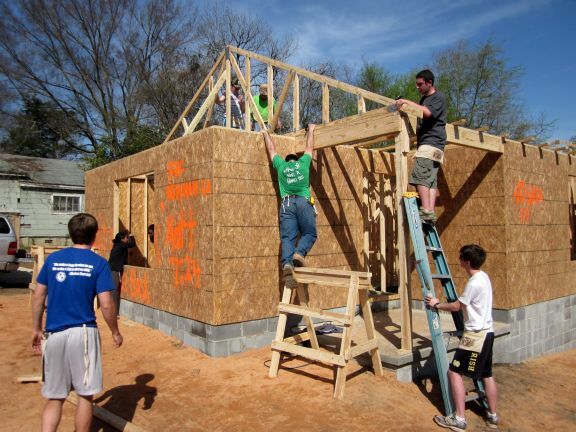 Learn how to get involved with our thriving Student Builders program. 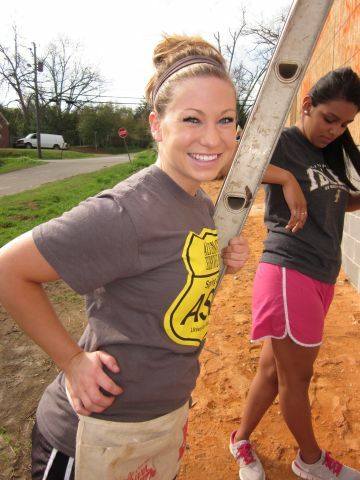 See more photos of the University of Idaho students working in Lumpkin, Ga.